The Genesis radio remote control is the state of the art in modern configurable remote controls. Utilizing the highly configurable “move” platform, new generation electronics are continuously being added, taking the enhancement possibilities to new levels. Sturdy and reliable, with modern and ergonomic shapes, the Genesis is designed to be safe and easy to use in a variety of industries and applications. A rugged nylon casing protects against shocks, scratches and is resistant to acids, oils and chemical agents. Rubber coating on the ergonomic handles allows for easy grip, even in wet conditions. The IP65 (water and dust tight) rating and temperature resistance from -20°C to +70°C (-4° to 158°F) make the Genesis suitable for all kinds of environments. A practical hand rest helps fight fatigue while allowing for smoother maneuvering. 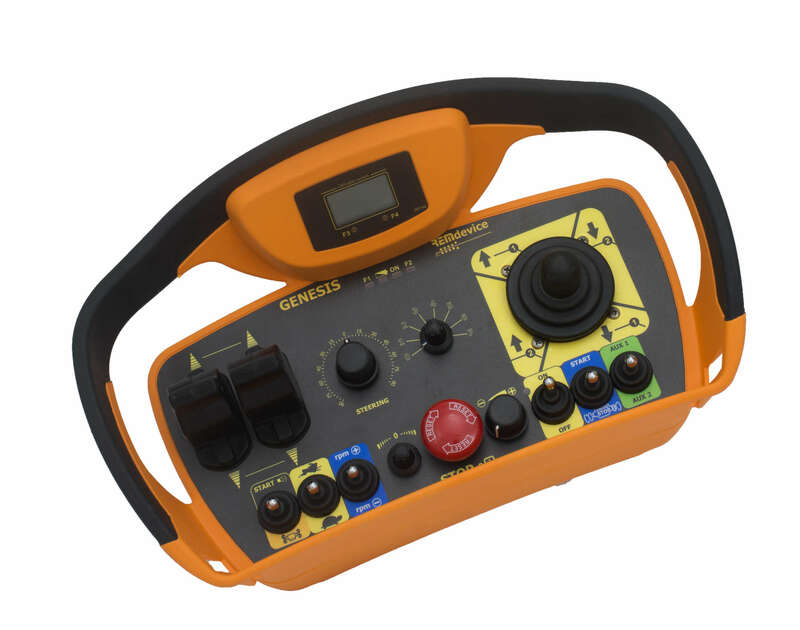 Installation is a snap because the transmitter can control the frequency, program automatic switch off functions, enable low power start up, and program the auxiliary button functions to meet your requirements. CANopen connectivity with over 50 basic profiles, along with RS422 and RS485 connectivity for PLC and automation allow for nearly unlimited programming and integration possibilities. The internal battery is charged via the patented wireless electromagnetic induction charger, or by external rechargeable Li-Ion batteries. An innovative no-stop system enables continuous operation of the remote control even while the batteries are being replaced. There are several options for the receiver unit. The RX DIN receiver is designed for mounting inside another electrical enclosure. We also offer enclosed receivers in IP65 rated enclosures. The RubyBox is the more rugged design, while the Ecobox is a compact case for tighter installations. Directional and high gain antennas are also available on request.